NANTES, France, Oct 5 2013 (IPS) - With presidents and prime ministers failing to take meaningful action to avert a planetary-scale climate crisis, the mayors of cities and towns are increasingly stepping up to enact changes at the local level. “Cities are on the front lines of climate change,” Richard Register, founder and president of Ecocity Builders, an organisation that pioneered ecological city design and planning, told IPS. Cities are truly ground zero for action on climate change, protection of ecosystems, biodiversity, energy use, food production and more because that’s where most people live today, he said. Cities consume about 75 percent of the world’s energy and resources. They are directly or indirectly responsible for 75 percent of global carbon emissions. 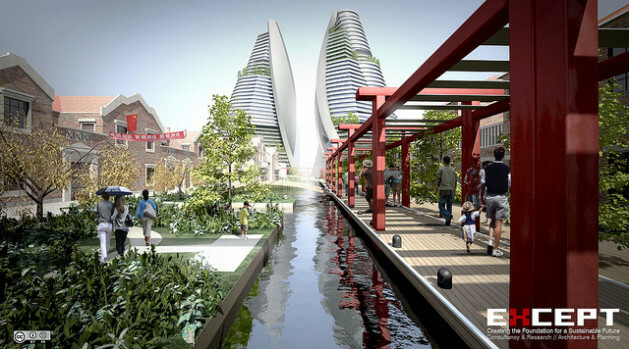 By 2050, 75 percent of the world’s 9.5 billion people will live in cities. The urban areas to house this huge increase amounts to more than all the building humanity has ever done. Nearly all of this new building will be in the developing world. “We continue to have the political courage to act,” said Anna Tenje, deputy mayor of the small Swedish city of Växjö, which slashed its carbon emissions 40 percent and aims to be Europe’s greenest city. Växjö was a very polluted region in the 1960s, but the public and business community backed efforts to re-invent it as a green city. People now fish and swim in the once polluted lakes that surround the city, she said at the 10th Ecocity, the World Summit on Sustainable Cities, a recent conference that drew more than 2,000 mayors, local officials and members of civil society to Nantes. Växjö is doing also every well economically, Tenje said, proving that cutting emissions is not a burden. All new apartment blocks are so well-insulated they don’t need furnaces for heat. Solar panels have been installed in schools and on the roof of City Hall. A biogas plant produces vehicle fuel from sewage and school food leftovers, while another larger plant using domestic waste as its feedstock is under construction. Last year’s landmark sustainability summit Rio+20 in Brazil chose “The Future We Want” as its motto. While little was accomplished in Rio, some cities and towns were already creating the future they want, said Andrew Simms, a climate economist at Global Witness and fellow of the New Economics Foundation in the UK. Around the world, cites and towns are creating their version of what Simm’s nine-year-old daughter calls ‘Happyville’: Green, sustainable places with thriving local economies and healthy, prosperous lifestyles for all residents, Simms told IPS. Cities can also grow much of their own food, Simms said, noting that Havana’s urban gardens grow half the city’s fresh fruit and vegetables. New York City estimates it has 4,000 acres on which it too could grow food. The city of Boulder, Colorado is working towards producing all of its own food. Skyrocketing resource use fuelled by overconsumption remains a major challenge, but here too cities have a major role to play. The Brazilian mega-city of Sao Paulo banned billboards and transit advertising, while Europe’s premier city, Paris, has reduced such advertising by 30 percent to beautify the cityscape and de-emphasise material consumption. The only barriers to every village, town and city becoming ‘Happyville’ are a lack of political courage and self-interest dominating public interest, he said.